FDA regulation of GMOs: Give genetic engineering some breathing room. Government regulations are suffocating applications with great promise. 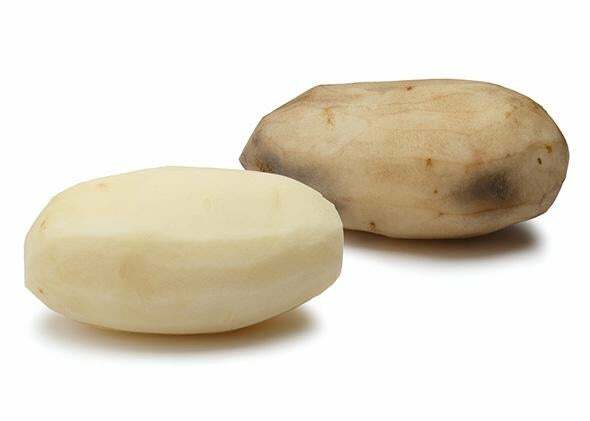 An Innate Russet Burbank potato next to a conventional Russet Burbank potato 30 minutes after peeling. This piece was adapted from an article in the Winter 2015 edition of Issues in Science & Technology. The newly approved, genetically engineered “Innate” brand of potato is quite remarkable. It is bruise resistant and contains 50 to 70 percent less asparagine, a chemical that is converted to acrylamide, a presumptive carcinogen, when heated to high temperatures. The advantage of lower levels of acrylamide is obvious, but the bruise resistance is important to sustainability because of the potential to decrease waste. The Innate potato is one example of new genetic engineering techniques that are more precise and versatile than ever. These advances promise a new generation of improved crops, animals, and microorganisms that will be attractive to the public. But the new techniques also raise critical questions about public policy. How will the various regulatory agencies approach them as a matter of law and regulation? What will be the regulatory costs, time, and effort required to bring them to market? And, further out, how will regulatory agencies approach the emerging field of synthetic biology, which involves the design and construction of new biological components, devices, and systems, so that standardized biological parts can be mixed and assembled? Based on recent history, the answers to such questions are not comforting. Most of the federal agencies involved have ignored both common sense and the consensus of the scientific community, and policymakers and federal bureaucrats have crafted regulations that have created formidable regulatory delays and expense. The public and private sectors have squandered billions of dollars on complying with superfluous, redundant regulatory requirements that have priced public sector and small company research and development out of the marketplace. Numerous national and international scientific organizations have repeatedly addressed whether there are unique risks associated with genetic engineering. Their conclusions have been congruent: There are no unique risks from the use of molecular techniques of genetic engineering. Perhaps the most comprehensive and unequivocal analysis of the risks of genetically engineered plants and microorganisms is the 1989 National Research Council report “Field Testing of Genetically Modified Organisms.” It emphasized that the more modern molecular techniques “are more precise, circumscribed, and predictable than other methods. They make it possible to introduce pieces of DNA, consisting of either single or multiple genes that can be defined in function and even in nucleotide sequence. … With organisms modified by molecular methods, we are in a better, if not perfect, position to predict the phenotypic expression.” Close to three decades later, the techniques that were the focus of the report are still widely used, and the newer refinements are even more precise and predictable. Thus, there has been a broad consensus in the scientific community, which has been reflected in statements of federal government policy going back more than 25 years, that the newest techniques of genetic modification are essentially an extension, or refinement, of older, less precise, and less predictable ones, and that oversight should focus on the characteristics of products, not on the processes or technologies that produced them. In spite of such guidance, regulatory agencies have generally chosen to exercise their discretion to identify and capture molecular genetic engineering as the focus of regulations. Those choices have drastically affected the progress of agricultural R&D. The U.S. Department of Agriculture, through its Animal and Plant Health Inspection Service, is responsible for the regulation of most genetically engineered plants. APHIS had long regulated the importation and interstate movement of organisms (plants, bacteria, fungi, viruses, etc.) that are plant pests, which were defined by means of an inclusive list—essentially a binary “thumbs up or down” approach. A plant that an investigator might wish to introduce into the field is either on the prohibited list of plant pests, and therefore requires a permit, or it is exempt. This straightforward approach is risk-based, in that the organisms required to undergo case-by-case governmental review are an enhanced-risk group (organisms that can injure or damage plants), in contrast to organisms not considered to be plant pests. But for more than a quarter-century, APHIS has applied a parallel regime (in addition to its basic risk-based regulation) that focuses exclusively on plants altered or produced with the most precise genetic engineering techniques. To create it, APHIS concocted a new category—a “regulated article”—defined in a way that captures virtually every genetically modified plant for case-by-case review, regardless of its potential risk, because it might be a plant pest. In order to perform a field trial with a regulated article, a researcher must apply to APHIS and submit extensive paperwork before, during, and after the field trial. After conducting field trials for a number of years at many sites, the researcher must then submit a vast amount of data to APHIS and request “deregulation,” which is equivalent to approval for unconditional release and sale. These requirements make genetically engineered plants extraordinarily expensive to develop and test. The cost of discovery, development, and regulatory authorization of a new trait introduced between 2008 and 2012 averaged $136 million. APHIS’s approach to genetically modified plants is difficult to justify. Plants have long been selected by nature, as well as bred or otherwise manipulated by humans, for enhanced resistance or tolerance to external threats to their survival and productivity, such as insects, disease organisms, weeds, herbicides, and environmental stresses. Through a variety of techniques, plants have also been modified for qualities attractive to consumers, such as seedless watermelons and grapes and the tangerine-grapefruit hybrid called a tangelo. Many such modifications have involved far more drastic and extensive genetic changes than those made by molecular techniques. One technique, “wide cross” hybridization, performed by plant breeders since the 1930s, moves large numbers of “alien” genes from one species or one genus to another in order to create plant varieties that cannot and do not exist in nature. Common commercial crops derived from wide crosses include tomato, potato, sweet potato, oat, rice, wheat, corn, and pumpkin. The basic tenets of government regulation are that similar things should be regulated similarly, and the degree of oversight should be proportionate to the risk of the product or activity. For new varieties of plants, it is not the source or the method used to introduce a gene but its function that determines how it contributes to risk. Under USDA and APHIS, however, only plants made with the newest, most precise techniques have been subjected to more extensive and burdensome regulation, independent of the risk of the product. Under its discriminatory and unscientific regulatory regime, APHIS has approved more than 90 genetically engineered traits, and farmers have widely and quickly adopted the crops incorporating them. After the cultivation worldwide of more than 3 billion acres of genetically engineered crops (by more than 17 million farmers in 30 countries) and the consumption of more than 3 trillion servings of food containing genetically engineered ingredients in North America alone, there has not been a single documented ecosystem disruption or a single confirmed tummy ache. With this record of successful adoption and use, one might have thought that APHIS would reduce its regulatory burdens on genetically engineered crops, but APHIS continues to push the costs for regulatory compliance into the stratosphere while its reviews of benign new crops have become ever more dilatory. Evaluations that took an average of six months in the 1990s now take three-plus years. APHIS’s performance compares unfavorably with its counterparts abroad. From January 2010 through June 2013, the average time from submission to decision was 372 days for Brazil and 771 days for Canada, versus 1,210 days for the United States. But the EPA regulatory net captures pest-resistant plants only if the “protectant” has been introduced or enhanced by the most precise and predictable techniques of genetic engineering. The registration process is excessively complex and burdensome. The submission required for regulatory review includes copious data on the parental plant, the genetic construction, the behavior of the test plant, and so on—requirements that could not be met for any plant modified with older, cruder techniques, which are exempt from the FIFRA rules. EPA then conducts a series of redundant case-by-case reviews—before the initial trial; when trials are scaled up or tested on additional sites; and again if even minor changes have been made in the genetic construct. Those reviews are then repeated when the sponsor is ready to cultivate the plants at commercial scale. This approach, which has been condemned repeatedly by the scientific community over many years, has discouraged innovation and provided incentives for the developers of new plant varieties to use inferior but unregulated techniques. There are far more rational—and proven—alternatives to the current unscientific regulation of genetic engineering. For more than two decades, the Food and Drug Administration has had a scientific, risk-based approach toward “novel foods” made with any technology. Published in 1992, the statement of policy emphasized that the agency’s Center for Food Safety and Nutrition does not impose discriminatory regulation based on the use of one technique or another. The FDA concluded that greater scrutiny is needed only when certain safety issues arise. Those safety issues include the presence of a completely new substance in the food supply, changes in a macronutrient, an increase in a natural toxicant, or the presence of an allergen where a consumer would not expect it. In addition, the FDA has properly resisted calls for mandatory labeling of genetically engineered foods as not materially relevant information under the federal Food, Drug, and Cosmetic Act, and as not consistent with the statutory requirement that food labeling must be accurate and not misleading. 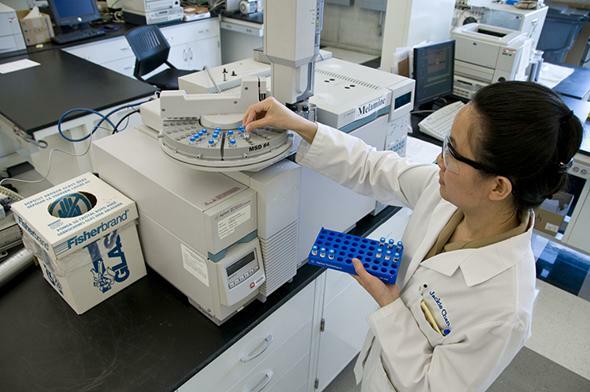 An FDA chemist uses gas chromatography to measure levels of melamine in food samples on Feb. 5, 2009 in Irvine, California. However, FDA has been less successful with its oversight of genetically engineered animals. In 1993, developers of a faster-maturing genetically engineered salmon—an Atlantic salmon containing a particular Pacific Chinook salmon growth hormone gene—first approached FDA. After 15 years of indecision, in 2008 the FDA’s Center for Veterinary Medicine decided that every genetically engineered animal intended for food would be evaluated as a veterinary drug and subjected to the same premarket approval procedures and regulations as drugs (such as pain relievers and anti-flea medicines) used to treat animals. The rationale offered was that a genetically engineered construct “that is in a [genetically engineered] animal and is intended to affect the animal’s structure or function meets the definition of an animal drug.” But this explanation conveniently ignores the science, the FDA’s own precedents, and the availability of other, more appropriate regulatory options. Adoption of the FDA’s existing approach to foods (which is far less protracted and intensive than that for veterinary drugs) would have sufficed and should have been applied to genetically engineered animals intended for consumption. Instead, FDA interpreted its authority in a way that invokes a highly risk-averse, burdensome, and costly approach. The impact has been devastating: The FDA has not approved a single genetically engineered animal for food consumption. An entire, once-promising sector of genetic engineering has virtually disappeared. So is there any reason for optimism about the future? How will the various regulatory agencies approach the newest refinements of genetic engineering? How will they respond to synthetic biology? The nation has already foregone significant benefits because of the over-regulation and discriminatory treatment of genetic engineering. If we are to avoid repeating those mistakes for newer genetic modification technologies and synthetic biology, we must have more scientifically defensible and risk-based approaches to oversight. We need and deserve better from governmental regulatory agencies and from their congressional overseers.